At CTIA in New Orleans today Sprint announced a first-of-its-kind mobile hotspot, the Tri-Fi Hotspot, which contains a CDMA radio and both a Wi-MAX and an LTE 4G radio. This is a tailor-fit solution for Sprint, which is in the middle of a big project to upgrade its 3G CDMA network, build a new LTE network and keep its existing Wi-MAX network in operation. 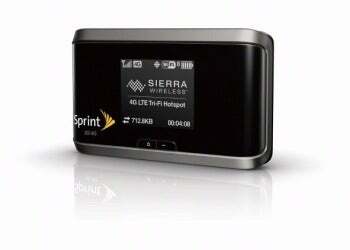 Sprint says the upgraded CDMA and new LTE networks will launch this summer. The new hotspot is designed to allow "families, small businesses and traveling co-workers to easily share high-speed connections." According to recent PCWorld research, those connections aren't very "high-speed" right now, but this is expected to change as the carrier turns on its new LTE network and upgraded CDMA network. Mobile hotspots recieve a 3G or 4G cellular signal from the air, then create a small ad hoc Wi-fi network that can connect 7-10 users within a radius of about 30 feet. Beginning May 18, Sprint customers will be able to buy the new hotspot for $99.99 (after a $50 mail-in-rebate) with a two-year service agreement. Data plans for the Tri-Fi run at $34.99 for 3GB of combined 3G/4G data, $49.99 for 6GB of data, or $79.99 for 12GB. Sprint claims these plans deliver 20 percent more data for the same price as AT&T and Verizon’s similar plans. The Tri-Fi Hotspot is powered by a 3600mAh battery, which Sprint says will provide "up to eight hours" of continuous use or up to eight weeks on standby. The device also has a large screen that displays the hotspot name and access code, battery life, number of devices connected, and whether the current connection to the network is 3G or 4G. PCWorld will be getting one of these nifty devices in for testing soon, and will publish a review after putting it through its paces.